Could the iPhone 8's finger scanner be embedded in the power button? OK, so the Apple iPhone 8 (or whatever the special anniversary model is going to be called) will most probably have an all-screen design. The leaks and reports have been aplenty, Apple is going the Galaxy S8 and LG G6 route. And that's great, but it leaves a big question — since the home button will be gone for that design, where is the fingerprint scanner going to rest? Early reports suggested a back-mounted sensor, but many have since said that Apple is working on a scanner embedded in the phone's display. That's a tech that we've been hearing about for a while, and even Qualcomm is confirmed to be working on its own variant. But it's still unknown whether Apple will be able to pull off a mass production of the display panels, as some reports say it's having troubles there. So, a lot of people dislike the idea of a back-mounted sensor, but Apple may be unable to deliver a front-placed yet. What's left? Well, it seems that a scanner in the power button may be an option that is still on the table. Last month, Apple was granted a patent for a fingerprint scanner, embedded in a thin housing that's located on a device's side. The patent was filed for in Q2 of 2015 and has just been granted this year. The documentation continues to explain that the sensor may collect biometric data when the user touches it or presses the button. It also says that the device's processor may perform a number of different operations once the user's print has been scanned. This may suggest gesture shortcuts, but we'll see about that. Seeing as we've seen a bunch of sources draw the iPhone 8 as having an abnormally large power button (in designs since the iPhone 6, it has been as large as the volume up and down keys), it's not unlikely that Apple has been toying with the idea of embedding a scanner in it. 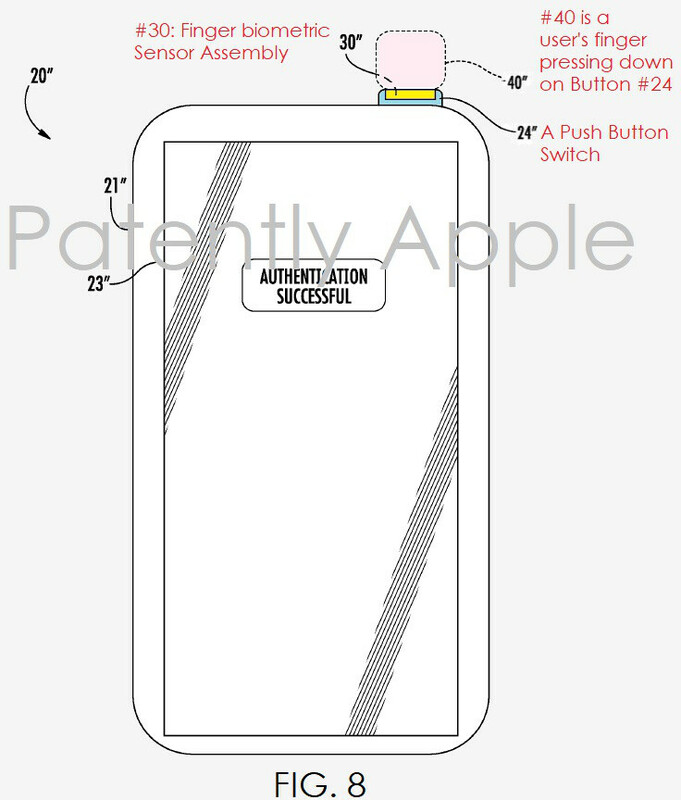 However, you will notice that the patent's illustration shows a top-mounted power button, something that's found in the design language of the iPads and long gone from iPhones. Maybe Apple plans to do this for a future generation of the iPad Pros? As interesting as it may be to speculate on these, do keep in mind that patent grants often lead nowhere. Companies would file a patent for some tech, which they believe they might use at some point in the future just in case, but often don't follow through. Oh so they'll imitate Sony. I can't recall the last time Apple came with their own new ideas. Clearly your age is 1 years old then!!!! Please name "something" Apple cam up with that NOBODY has ever had in some form or another. I wish you the best of luck. You must were born last night! Who gives a s**t? I’ll tell you. People who have nothing more important going on in their lives. Like you, for example. +1 After the first IPhone 2g and IPhone 3g being truly innovation, most of the time Apple just rebuild a thing that Android introduced. Of course they did something that copied from Android better than android itself, but that still a fact and now this. So you rather have a dedicated button then? Maybe. On a second thought, instead of complicating things for themselves, they should just put the fps on the power button and get it over and done with tbh. Although i still think apple will pull of the under display fps for the ip8 tho. Seems like Bankz still not giving up. I think Samsung just didn't want to put in the time or money TBH, they already spend so much on manufacturing so many things that I could understand from a financial and that time is money point of view that Sammy didn't want to wait and release the S8 later in the year or spend the money just to have fps under the screen. I believe Sammy could have done it had they kept up the tempo of developing the tech and decided to release the S8 along side the Note 8 later this year. My point is, if Apple truly wants the tech at all cost then they could pull it off given the late release date of new iPhones. They have already been putting in the time and money. Clueless! Derp! First, Samsung was working with Synaptics which also had a similar FPS. Samsung had issues with it being slow and insecure. Then they switched to this other company. Apple also worked with Synaptics to help its own company it bought to get it right, and they too are having issues. You are aware, that having all the frikkin Jack in the world, doesn't solve all problems....right? I mean you are smart enough to know that! At least I hope. If not then I pity you! Actually I don't! Your the derp lol, I never said they hadn't been putting in the time and money, just not as much time and money as they would have needed to have the tech ready for the S8/N8 and most likely for the reasons I gave. I don't need your explanations Techie. Why not? It brings enough entertainment to fanboys and trolls like you. More clicks, more income! The lateral placement approach is pretty good. You can wake the phone while on a table. It will also work well with VR. The back placement is horrible and I would never buy such a phone. Yes. Use the Power Button till the display-FP scanner issues are totally worked out. Way to go, Apple!! Not really a fan of side mounted scanners, but looks like this is what Apple needed to do if the under screen scanner tech isn't ready for prime time. If that's where apple puts it I think it's a good place. I have no trouble with the s8+, but in the power button would be even better to me. JMO of course. So, the sides if the iPhone 8 would have to be thicker to accommodate the fingerprint scanner. Where ever they put it, it just needs to work right...thats the important thing. Apple has FPS reliability on lock. It'll be great, where ever it's located. This would be a good move by Apple and what I figure they might do since they too were having problems implementing the FPS under the display. Look if Samsung and LG, who are the leaders in all things OLED are having a hard time I would have to logically conclude Apple would have and even harder time accomplishing it. I think its a better placement IMO than where the S8 and S8 plus have the FPS. Holding out for under screen scanner!!!! !